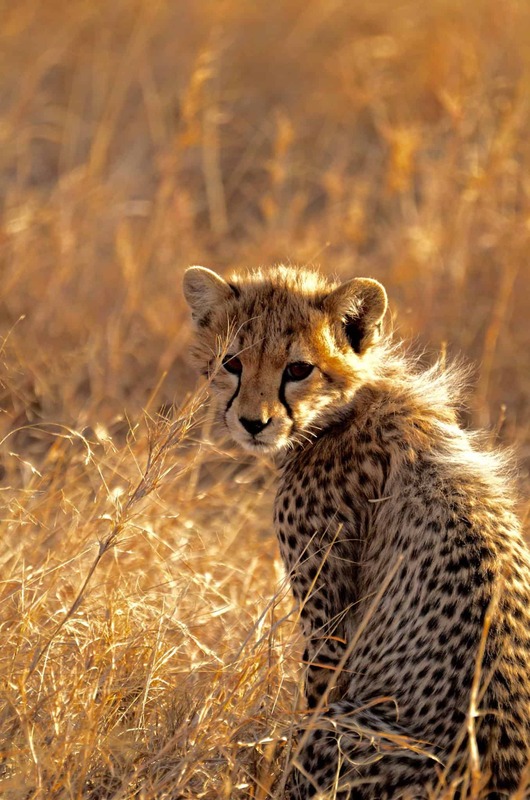 Explore all the colour and excitement that East Africa has to offer with this combined safari adventure that covers two countries: remarkable Tanzania and magical Kenya. You’ll experience majestic landscapes teeming with wildlife and exotic plants; wide azure skies, apricot sunrises and golden pink sunsets and night skies ablaze with stars. 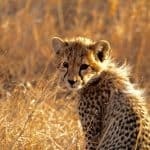 You can expect all this, plus the exhilaration of gazing on the “Big Five”: the ferocious lion, the majestic elephant, the swift leopard, the tough rhino and the aggressive Cape buffalo as well as gazelle, giraffe, zebra and hyenas. 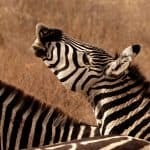 Our Tanzania Kenya Safari encompasses so many different kinds of beauty. From Africa’s Garden of Eden – the breathtaking Ngorongoro Crater, a UNESCO World Heritage site – to the stunning ecosystems of the Masaai Mara National Reserve, its mesmerising neighbour the Serengeti where wildlife roams unbounded and the stunning landscapes and glory of flora and fauna at the lesser known and more select Naivasha National Park, Amboseli National Park and Tarangire National Park. 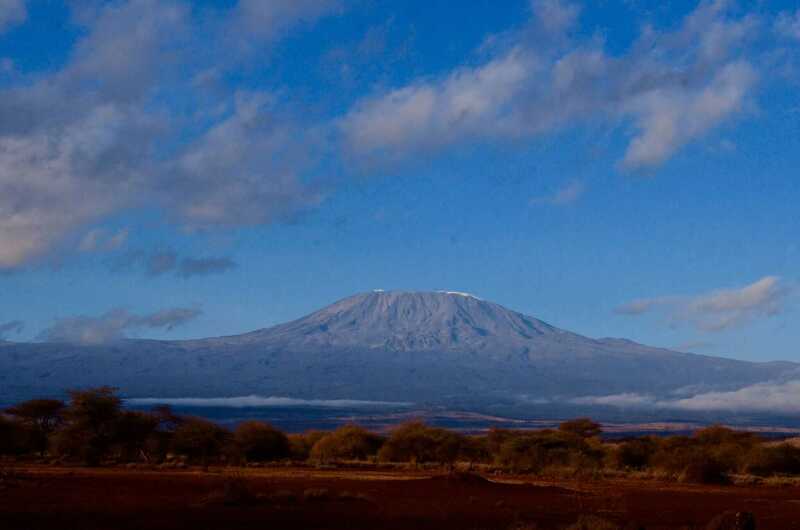 We also offer a Kenya Tanzania Safari adventure, but our Tanzania Kenya Safari adventure will suit you if you plan to climb the majestic Kilimanjaro first. You’ll have plenty of excitement on your Tanzania Kenya Safari while you rest your legs which will be exhausted from all that climbing! After a tasty breakfast we will depart from Moshi and travel to the Tarangire National Park, a land of cloudless skies and baked earth in the dry season and lush in the rainy season - but whatever the season you can be sure of sighting dozens of the 550 species of birdlife that constantly strut, flitter and swoop here. These include the world’s largest bird, the ostrich, and shrieking colonies of dazzling yellow-collared lovebirds. Shy dwarf mongoose make their homes in the colossal termite mounds that bring a surreal architecture to a busy landscape also decorated with the ancient baobab tree. On your game drive you’re sure to see family groups of the majestic elephant, and don’t forget to look closely at the trees: you might see a leopard stretched on a stout branch, lazily flicking its tail. Look more closely and you could see a python, resting between meals. After a busy day you’ll be driven to the Mto wa Mbu to the campsite, which has a range of good facilities, and cooked a delicious dinner under a sky awash with stars. As the stars fade in the glow of dawn you’ll wake to a pink and apricot sunrise and be served an appetising breakfast as a cheerful start to your adventure to the Serengeti National Park. We will drive near – but not into (yet) - the verdant Ngorongoro Crater. 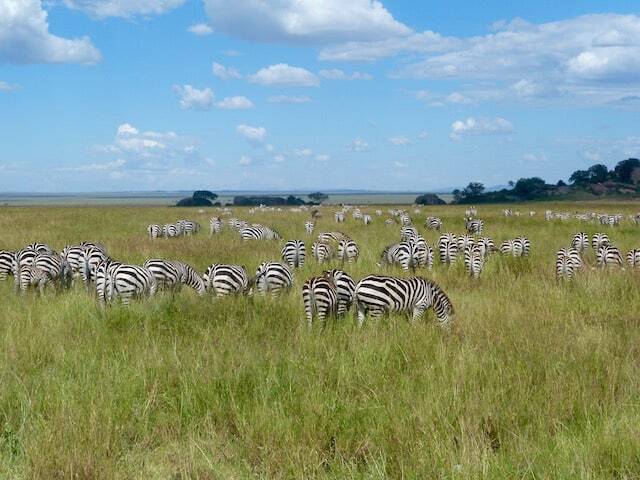 Our real Ngorongoro Crater adventure is later on but first it’s time to enjoy the Serengeti. The Serengeti ecosystem is one of the Seven Natural Wonders of Africa, and you can see why: the endless golden savannah is decorated with bursts of colour of flowers of all descriptions attracting the buzzing of bustling insects and the calls of a thousand different birds. You’ll spot ear-twitching gazelle and perhaps be lucky enough to witness the famed annual migration of the brindled wildebeest. Watch out also for the toughest animal you’ll ever likely to meet: no, not a rhino, but the fearless honey badger. 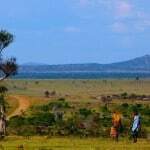 We’ll enjoy a lunch stop on a kopje and then make our way further into the Serengeti for some more wildlife watching. You’ll rest your tired eyes and muscles in a comfortable camp, listening to the sounds of the night. This morning there’s another chance to spot the wildlife you may have missed yesterday: it’s so diverse here that you are bound to witness one amazing creature after another. 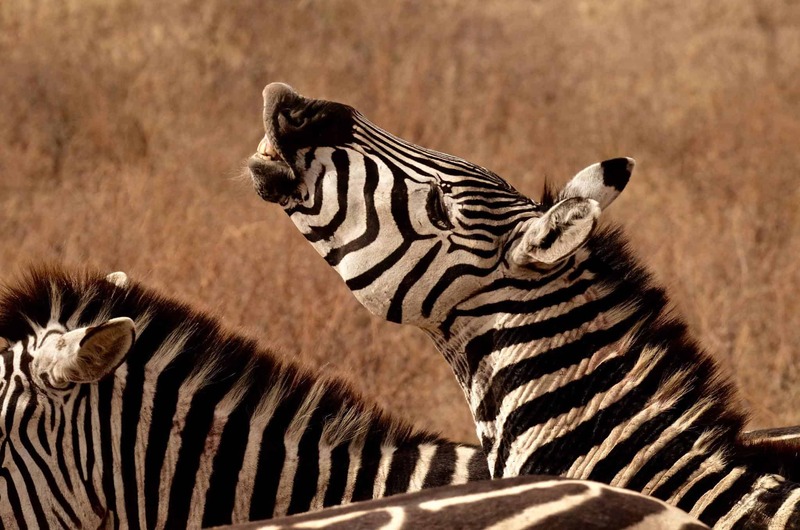 Our guests regularly spot a myriad of animals: lions, leopards, elephants, cheetahs, buffaloes, zebras, wildebeest, elands, wild dogs, gazelle, crocodiles, giraffe, zebras, monkeys, baboons, hippos, rhinos and antelopes. Tonight’s campsite is the comfortable Simba campsite and it’s wonderfully located right near the rim of the Ngorongoro Crater itself. You’ll enjoy a delicious dinner while you look forward to tomorrow’s adventure in the Crater itself. It’s an early start for you as early morning is the best time to spot game. 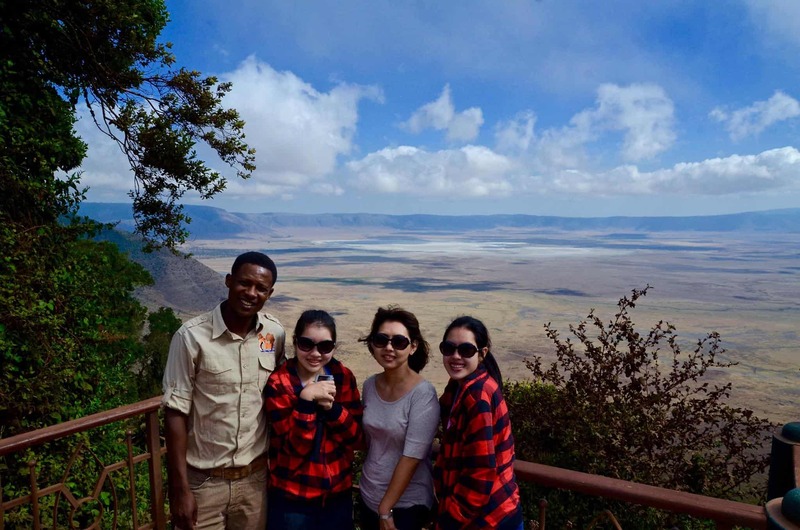 After a dawn breakfast we’ll drive to the Ngorongoro Crater and be dazzled by the biodiversity of this special place. The Crater was formed millions of years ago as a result of a great volcanic eruption, and it is the largest unflooded caldera in the world. Everywhere you look you’ll see something amazing. There’s not just a good possibility of spotting all the Big Five but you’ll be delighted by the shimmering pink of a flock of flamingos decorating the great Soda Lake; you’ll gaze on the hypnotic circling of vultures in the sky as well a myriad of other animals. After a morning’s fascination we’ll break for a picnic lunch inside the Crater and shortly after this well-earned rest we’ll drive back to Moshi and spend overnight at the Rafiki Backpackers & Guesthouse, a clean, welcoming home away from home with a magical view of Kilimanjaro. 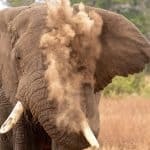 After a delicious breakfast you’ll set off on the second part of your adventure, to the border with Kenya and the beautiful Amboseli National Park. On the way you’ll stop at Marangu, a pretty little farming town on the threshold of Kilimanjaro itself, with the oldest and most traditional climbing route named after it. After a tour of the Kilimanjaro National Park entrance and visitor’s centre, you’ll admire the cool and bubbling waterfalls near Marangu. Then it’s on to the Tanzania/Kenya border where you’ll be welcomed by the friendly Mara Explorers crew and driven to the Amboseli National Park, tomorrow’s adventure. You’ll enjoy a delicious dinner in a camp just outside the park, with stunning views towards Kilimanjaro itself. 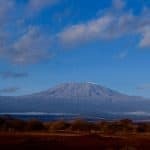 You’d better fill up on today’s delicious breakfast because you’ll spend the day amongst the breathtaking scenery and natural abundance of the Amboseli National Park, a land of big skies and big horizons, always watched over by the jewel, Kilimanjaro. Attracted by the springs, fed by Kilimanjaro’s ice cap, that bubble up in the centre of the park, family groups of elephants wander through the park and this is one of the best places in Africa to get up close to them. You’ll camp near the park and enjoy a delicious dinner in the warm dusk, as the stars appear one by one. If the moon is bright, you’ll see the landscape transformed to silver. 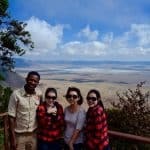 After a hearty breakfast you’ll say goodbye to the Amboseli National Park and depart for Lake Naivasha, at the highest part of the Great Rift Valley. You'll reach the park in the afternoon. For the first time on your adventure you’ll hit the water – a boat ride on the still and glassy waters of the Lake which reflects the glorious blue of the sky above. You’ll have the opportunity to get up close and personal with family groups of hippos. 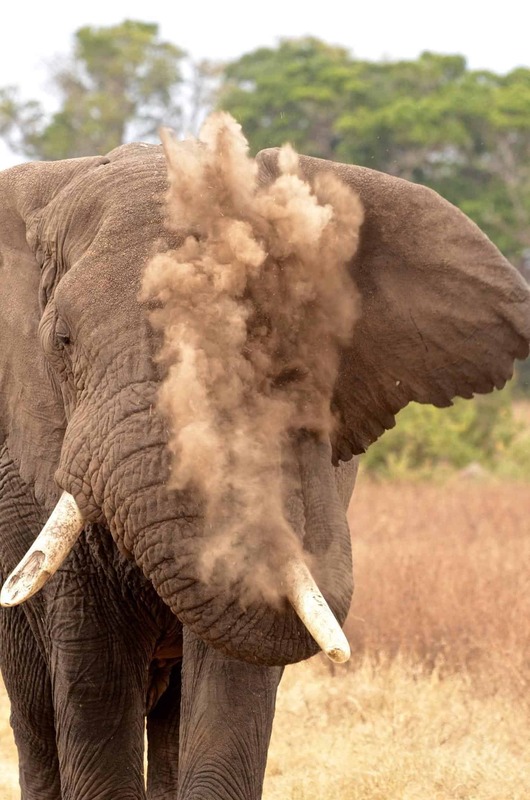 These amazing creatures are considered to be the third largest land mammal after the white rhinoceros and the elephant and need to surface every 3-5 minutes to breathe. Clouds of lake birds drift around and if you’re lucky you’ll catch an African Fish Eagle in action. After a day marvelling at the sights of this beautiful lake, you’ll return to camp for a heart dinner and a relaxing sleep under a sky packed with stars. After a restful sleep and a good breakfast you’ll travel under cloudless Kenyan skies to the legendary Maasai Mara National Reserve, Kenya’s flagship conservation zone, and arrive at the camp in time for lunch. 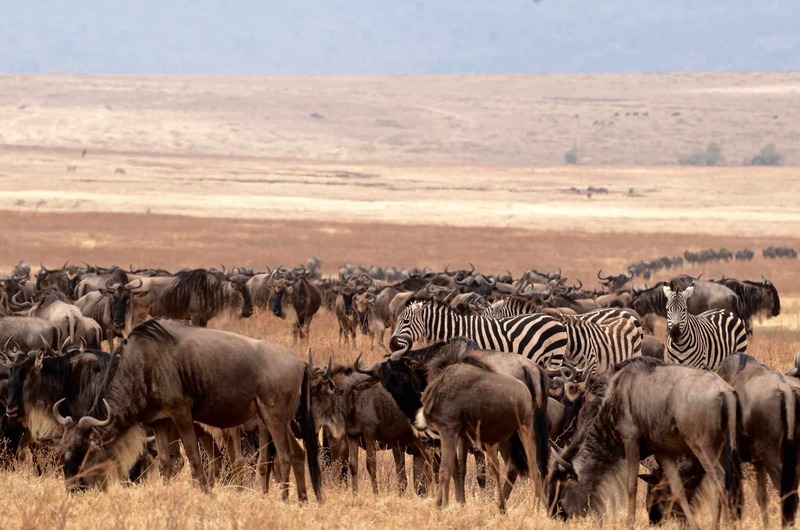 The Maasai Mara is famous for the number of species that abound including the Masai lions, leopards and cheetahs, and, together with the Serengeti, it’s the location of the Great Migration of wildebeest, zebra, topi, eland and Thomson’s gazelle every year from July to October. 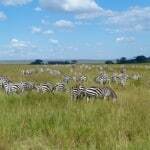 The Maasai Mara has to be experienced to be believed. 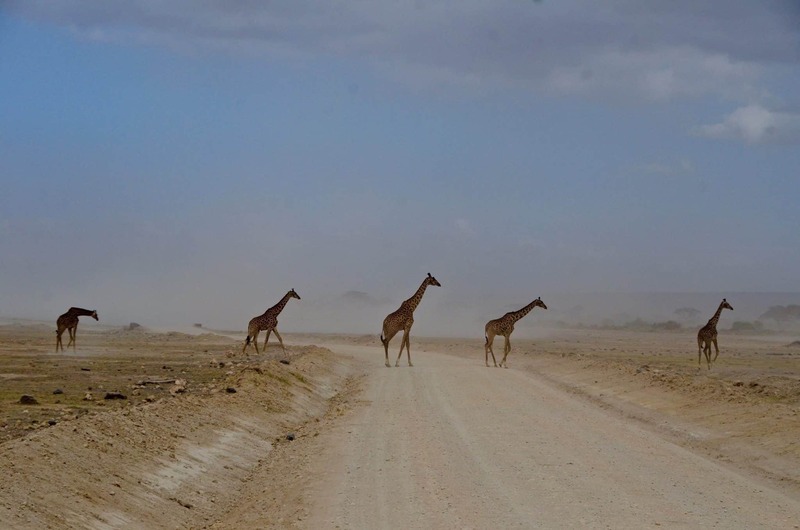 The wide horizons of open grassland are interspersed with seasonal rivulets which attract a myriad of animals including the distinctive Masai giraffe. Birds, too, abound, with 470 species spotted so far, including a variety of raptors and the snake-attacking secretary bird. After a satisfying afternoon of getting your bearings in the Maasai Mara, it’s back to camp for a filling dinner and a restful sleep before a full day’s game drive tomorrow. 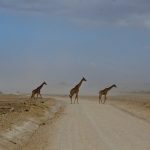 You’re penultimate day of your Tanzania Kenya adventure is spent in full safari mode: it’s a chance to soak up the sights and sounds of one of the most beautiful places on the planet. 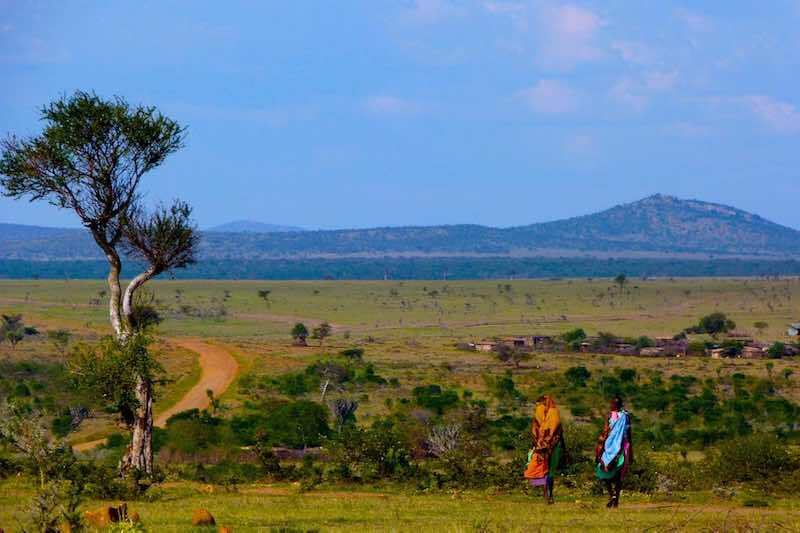 After enjoying a delicious breakfast at the campsite, you’ll spend the day exploring by van the delicate grasslands where you will never know what you might see next: perhaps a family of hyenas, any one of the Big Five, crocodiles creeping along the riverbank and maybe, just maybe, a black rhinoceros. Don’t worry, you’ll get a rest with a picnic lunch in the afternoon, and enjoy a good dinner in the evening spent listening to the cicadas under the starry sky. After ten days of excitement, the adventure isn’t over yet! 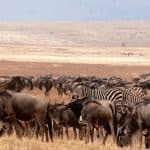 After a good breakfast you’ll have the opportunity to venture out on foot outside the Maasai Mara, accompanied by experienced guides who will show you details you may have missed by van. It’s a chance to stretch your legs and see the diversity of plants and insects up close; and for a good view of the beauty that surrounds you, climb Siana Hill which lies behind the camp. Here the rolling landscape reveals itself before you and the silence is almost deafening. It’s a beautiful place to reflect on the colours, sights and sounds of your adventure before you return to camp and depart for Nairobi around 11 am, where your Tanzania Kenya Safari will end.